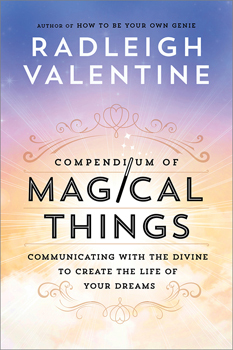 Following upon the success of his angel oracle card series, which removed the fear-based aspects that scared people away from Tarot,Radleigh Valentine presentsCompendium of Magical Things to bring light and understanding to other methods of communication with the Universe. This book captures Radleigh's sense of humor and his deft way of making complicated topics easy to understand. If Auntie Mame taught at Hogwarts, the Compendium would be her textbook! Compendium is an exploration of various methods for communicating with the Universe to gain insights and epiphanies and help manifest your dreams. The tools explored include runes, astrology, numerology, Tarot, Lenormand (divination cards, similar to Tarot), The Oracle of Kuan Yin (chi-chi sticks), the I-Ching, meditation and mantras, and talking to angels and fairies. Each topic will include a history of the tool, a redirection from the parts that are possibly frightening, and Radleigh's experiences with each method - including his beginners' fumbles and explorations! With the Compendium, you can discover the perfect language for you to communicate with the Divine and create magic in your life!